Fans of entomophagy say these premium freeze-dried Mealworms taste just like popcorn and are great for a quick, nutritious snack at any time of the day. 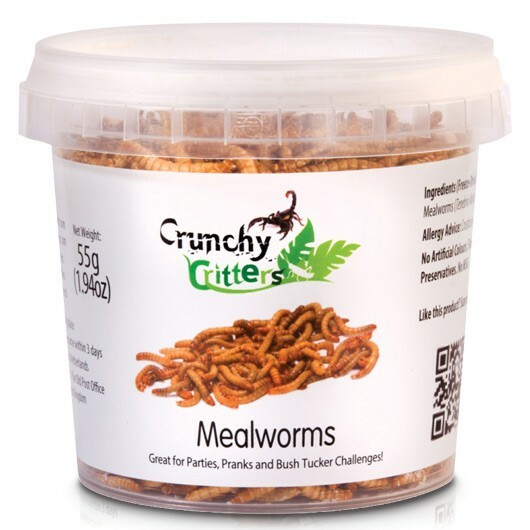 In fact, Mealworms are fantastically high in protein, low in fat and low in carbohydrates making them a healthy, nutritious alternative to mainstream staples like beef, chicken and even fish! They’re also crammed with essential amino acids and are an undeniably rich source of many minerals and vitamins needed to keep your body in peak condition. For instance, it’s widely known that insects are a great source of iron and their inclusion in your diet could actively help protect you from developing anaemia, which would hinder your workouts. 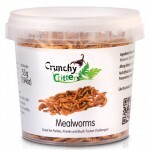 With their vast nutritional, health and environmental benefits, it’s easy to see why Mealworms and other crunchy critters are quickly becoming the new sushi. Prepared completed separately from our other products to avoid any chance of cross contamination. Please Note: Cooked insects are brittle and may not arrive whole or intact following their time in the postal system. We got these as kind of a 'fun to try, with the added benefit of freaking your entire network of friends and family out'. They're actually really not bad. They have a nice crunch and taste kind of nutty and salty, and I've found myself picking at them occasionally when I just want a bit of something but want to stick to a healthier snack. My sons happily tried them and enjoyed. My daughters wouldn't touch them - I'm working on them ;).